Offering activity from Venerable Gyatrul Rinpoche's centers and greater sangha. Starting with Ven. Gyatrul Rinpoche's very first invitation to His Holiness Penor Rinpoche in the early 1980s, His Holiness has repeatedly offered dharma teachings and bestowed major empowerments at most of Gyatrul Rinpoche's centers. He has consistently cared for all of us, directly through teachings and personal guidance, and indirectly through his vast compassion, ceaseless prayers and personal example of selfless service on behalf of the Buddha's Doctrine and for the welfare of the sangha and all beings. Rinpoche mentioned that "His Holiness is our whole dharma source. He has been so kind to us, has helped us a lot, not even caring for his own body, only thinking of benefit to the people and his monastery." As a way of showing our gratitude and appreciation to His Holiness, Gyatrul Rinpoche would like us to make a collective offering to His Holiness Penor Rinpoche's Wisdom Kaya in Parinirvana at Namdroling Monastery in South India. If possible, one or two students will travel to India and present the offering on behalf of Rinpoche, his centers and his students. "When a great lama passes, the merit of practicing and making such offerings, the merit of offering even a single water bowl, is considered to bring 100,000 times more blessings and generate more merit than at other times." At this time please reflect on the vitality of your connection to the dharma and your own enlightened nature that has been fostered by your relationship with His Holiness Penor Rinpoche and Ven. Gyatrul Rinpoche and try to meld your intentions and aspirations with theirs. Please make a donation of any amount as that will surely bring spiritual benefit to all of us. There are also many videos posted on Youtube and elsewhere. Public display of His Holiness Penor Rinpoche�s body and receiving blessings will be allowed in the ground floor of Zangdog Palri Temple of Namdroling Monastery starting on 9th April 2009 (Full moon day of the second Tibetan month) after the completion of thugdam and ablution rituals. However, if the thugdam continues beyond the expected time, the dates for public display may be postponed. The annual Palyul Summer Retreat for 2009 from July 10 to August 10 in New York Upstate, US, will be conducted as usual under the guidance of HH Karma Kuchen Rinpoche, HE Gyangkhang Tulku Rinpoche, HE Mugsang Kuchen Rinpoche and Khenchen Tsewang Gyatso Rinpoche. 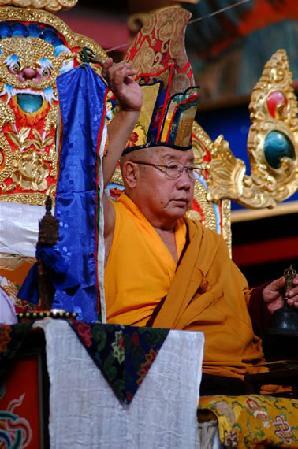 Details of the retreat announcements will be posted as soon as Karma Kuchen Rinpoche arrives in Namdroling Monastery.